Mega Builders Inc., a premier construction and Building Company, specializing in Commercial Building and Residential with a unique ability to combine vast expertise & professional competence with an outstanding customer service team. Helping you get the beautiful home renovation you always wanted. Giving you the fantastic kitchen remodel, bathroom, or all over home renovation and construction you always wanted. 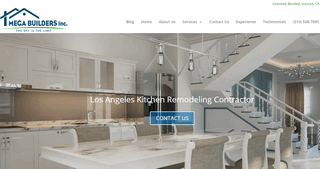 Providing fantastic tutorials and renovation ideas on our blog to inspire all our Los Angeles, CA native readers.